This weekend, I ticked something off my bucket list – I can now say I’m a marathon runner! After completing a couple of half marathons, I decided I wanted to step it up this year and give a full marathon a go. I can remember the first time I ever did a half and watching people go around for a second time thinking “wow, they must be crazy to want to do a full marathon” – but 4 years after my first half, I became one of those crazy people!! I’m not a natural runner at all, but the thing I like about running is you can train and reach your own personal achievements, whether it’s to win a race, complete your first or beat a personal best. 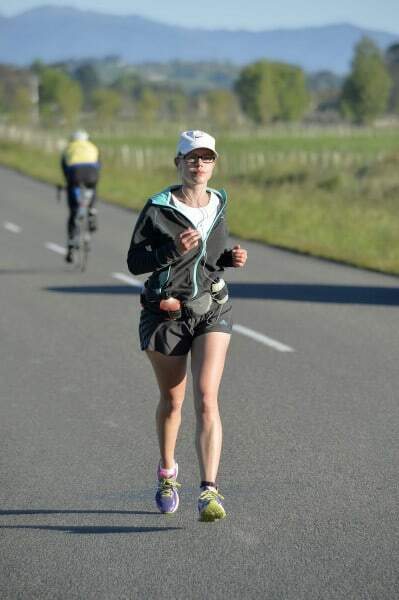 To run a long distance event, you need a plan to build endurance, strength and work on speed. There are lots of free plans available on the internet, or there’s always the option of paying to get a plan done specifically for you. I was recommended Hal Higdon’s plans which I really enjoyed. He has a range for total beginners, through to advanced. I picked the novice 2 programme since I had done a few half marathons. The plan was in miles so I converted it to kilometers and each day after the run, I ticked off what I had done. I found it really to do this and myself getting closer and closer to to race day. It was kind of like an advent calender in a way – with the reward being just completing a longer run each weekend. Long run training runs meant needing to take sports drink/gels with me along the way. I bought a Nike fuel belt to put sports drink in. This got a bit harder near the end of training when I needed more than I could carry with me and I used to get mum to put a bottle of water in her mail box, and have a gel with some water when I got to her place. A couple of times I took my eftpos card and went into the dairy to buy either water to top up my bottle to have alongside gels or a sports drink! When you’re running for 60-90 minutes at high intensity, it’s important to replace carbohydrate/electrolytes. We have enough glycogen (stored glucose) in our muscles to last around an hour, so you start feeling really flat after an hour and a half of exercise with no fuel. I tried two types of gels – Horleys and Leppin. I prefered the Leppin – you need to have less water with them and they were easier to get down. Eat breakfast at least 2 hours before running, no more than four so you have time to digest it and be able to utilise the energy in your run. You need carbs for fuel and low GI carbohydrate is the best – so you get a slow release of energy. My favourite pre long run breakfast was wholegrain toast with honey and banana. After nightmares of waking up late and not making it to the race, my alarm woke me up at 5am so I could have breakfast before the race start at 7am. I also had a beetroot juice shot before my run. Beetroot is high in dietary nitrate. Studies have quite consistently shown that consumption of dietary nitrate improves exercise efficiency, allowing you to exercise at a greater intensity for the same level of effort – so I was absolutely keen to give it a go! I felt really good in my first lap of the marathon, and I do think that this contributed. I tried not to think too much about the race before running it as nerves really upset my stomach and I didn’t want to be running to back and forth the loo before the race! So I relaxed and focused on being positive. When I arrived, it was pretty cold and there were lots of fit looking people there! I started of really slow, focusing on pacing myself. I use the Nike Running app when I run so I was able to keep a good handle on my pace. When I got to 15km, I ran past a man who started to run along with me. Now this was fine for a while, but he wanted to talk the whole time! I felt pretty good at this point and was able to run and talk for a bit, but after a little while I couldn’t concentrate on running and it was starting to bug me. I said nicely that I couldn’t talk and just wanted to focus on running, but he didn’t really get the hint. The nattering was really irritating me even though I knew he was trying to be helpful and encouraging. I must have run In the end I ran at a much faster pace for around 500m-1km to get ahead. This was probably a bad idea in hind site as it drained a bit of energy. I reached the turn around point at 2 hours 13 minutes. My legs were starting to feel a bit sore here, and I stopped briefly at 22km to stretch my quads which felt awesome. At this point, one of the lovely ladies from work came by on her bike to support me. This was so awesome to see a friendly face encouraging me on and it gave me a boost. I also knew I had my amazing friend Caroline and my fiancée waiting for me at the next drink stop (I told them I’d be fine for first lap but if they could support me on the second it would be good). Seeing them at the first drink stop on the second lap was amazing! They handed me a gel and cheered me on a bit. They continued to support me at various spots along the way which was so good. It’s amazing what a boost it is to have someone to encourage you on when you’re feeling sore and tired. When I got to around 28-30km my legs were super sore – part of the race has some undulating hills – on the first lap they didn’t feel bad at all, but the last incline on the second lap was a killer. My legs were so sore and I was getting some shooting pain up my right side. I got pretty slow after this. The last 8km were super hard – it wasn’t that I was really puffed, it was just my legs were so sore! I walked about 100 meters remembering in my training plan that it was better to walk when you felt you needed to rather than when you had to, and this was good as my legs felt slightly better after a little break. At the last drink stop, Libby came by on her bike again. She rode alongside me (even though you’re not supposed to!) for about 1km and this was so amazing at this point the finish line seemed so close but so far away. It helped me make it! I had no leg power to race to the finish line and I felt like I was trying to run fast, but it was actually slow! Seeing and hearing friends at the finish line the best thing, and I crossed the line at 4 hours 45 minutes and 46 seconds, and promptly lay down in the grass!! I felt quite emotional after finishing! I was pretty pooped for the rest of the day and had a nice little nap for an hour. My amazing friend Caroline gave me a voucher for a Full Body Massage for doing the marathon – I’m totally looking forward to using that. I’m now looking forward to doing another event – but I think I’ll stick to half marathons for a while now – marathon running means a lot of time, and a lot of commitment. I want to try and beat my last personal best for a half marathon. If you’re looking for a personal fitness challenge, then running a marathon is something I’d recommend – follow the plan, eat well, have support and you’ll be able to do it! A fascinating read Nic – had wondered how the nutrition side of things was managed. You are such an inspiration! Wow go you. 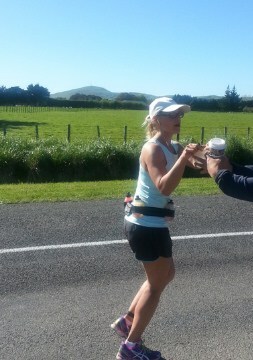 I’d love to do a marathon one day, I’ve done two 10km races and hoping to compete a half marathon in Auckland this year. Thanks for the read its helped me feel more positive after a horrendous run this morning. I too am training for my first full marathon after doing 12 halves. It was a very surreal feeling doing a half distance as a training run but great feeling to complete it. Im up to 24km now and have been feeling good but this mornings recovery :/ 16km completely did me in. Were off on holiday for a week so hope to recharge both my legs and my mind for the next big run. Love to hear more about your eating plan too as I think Im on track but am running on intuition rather than knowledge I guess. Im hoping to do under 5 1/2 hours so much slower but will just be happy to finish really. I’m glad this post helped you Michelle! I think it’s normal to have those bad runs – I had a few that’s for sure. I can’t even really remember what I ate exactly – I know I ate bigger carbohydrate portions and more protein, but I could tell if I didn’t fuel enough. One day my run was delayed as my plans changed and I really should have had something else to eat before my run but I didn’t and the last stretch was so hard and I had the worst headache ever after my run. All the best for your run! It’s an awesome achievement to reach – no matter what time you do.